The Rotax 185 is a small light weight engine, originally fitted to water pumps and used by firefighters in forest fire applications. It produces 9.5 hp when used in an aircraft engine application. Fitting Lazair’s with this engine allowed for the addition of floats, or simply better climb rate on any of the models. The Rotax 185’s were the preferred engine on the Series 2 Lazair’s and many of the first Series three models. Some of the later series three models were fitted with larger engines such as the Solo 210, JPX, or KFM. Pilots flying Lazairs fitted with Rotax 185’s from high altitude airports can get a bit more thrust to compensate for the reduced air density by drilling four 3/8″ diameter holes in the top of each muffler. This will increase the maximum propeller speed by approximately 150 RPM, but since It also produces a corresponding increase in noise, it is not recommended unless you’re sure you need the extra thrust. Dale could not locate a two bladed prop light enough to fit the need. However, since they had been producing a lot of the early lazairs with Pioneer engines fitted with a single plastic prop, he had a ton left over that fit the pioneers. 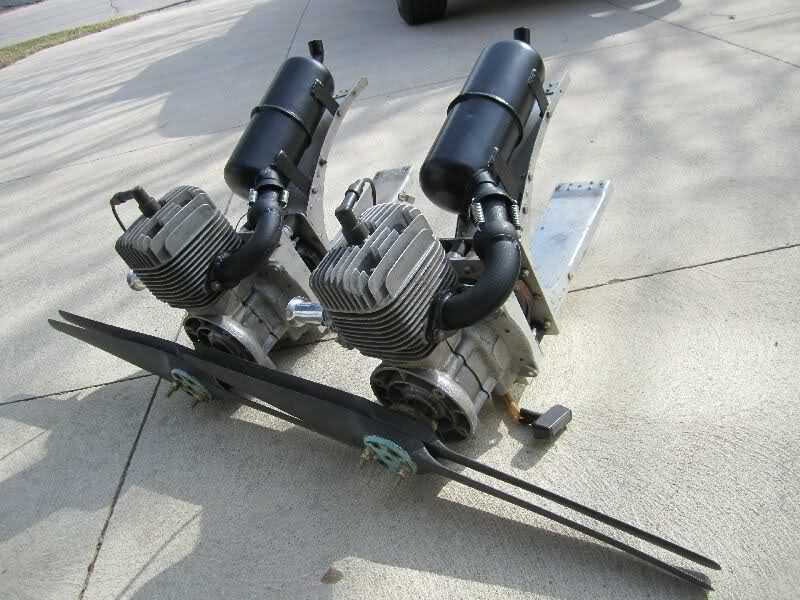 He found that these could be “doubled up” and help to produce the extra thrust that the Rotax 185 was capable of producing over the 5.5 hp Pioneer engines. These props were found to be light enough but mounting became a problem. Instead of designing and machining a new prop hub to accept the props mounted in a crosswise fashion Dale decided to mount them biplane style with longer bolts. This seemed to work just fine until the bolts began to fail in flight. 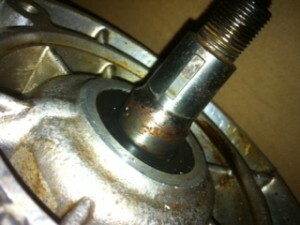 The cause of this was found to be bending loads on the bolts right where the threads begin and was due to fatigue. So a Service bulletin was produced to swap around the bolts so the nuts were on the front of the propellers. The rest is history. If your 185 has a woodruff key slot on the crankshaft it is not advised to run anything heavier than the biplane style props. Consequently, Rotax upgraded the Rotax 185 with stronger cranks which could accept much larger props. 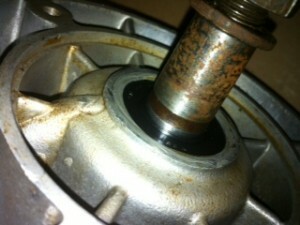 Many people now have the strong crank shafts installed in their Rotax. So how do you check to see what crankshaft your engine is running? You can actually check to see if you have the larger crank without pulling the prop and hubs. Right outside the front oil seal on the crank look for a small milled out “ring groove”. If you see a distinct small grove then your engine is equipped with a “larger” new style crank. Large cranks have no keyway for the prop hub and the prop hub has no keyway. This is the preferred crankshaft. You can run both the double biplane plastic props, or a wood Prince P-Tip prop which has become a popular choice. In contrast, an original “small” crank will have a short section of smooth shaft just outside the oil seal. Just before the prop hub you will also notice an abrupt taper down. And you will see that the shaft has a keyway and the prop hub has a keyway. Also all Bi-props in service should be the originally designed Carbon/ Nylon type not the briefly supplied and recalled Glass/Polyester. Tech update 9 covers this.